Visit our ebay store for closeout items. 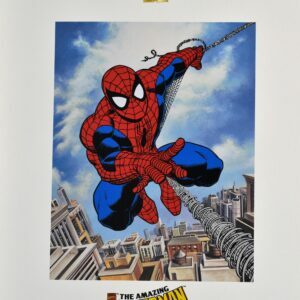 This lithoserigraph is entitled “Spider-Man.” This artwork was created by Romita Sr. and Jr. Has been licensed by Marvel. Includes a COA and measures 19×22 1/2. 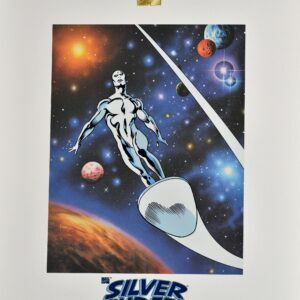 This lithoserigraph is entitled “Silver Surfer.” This artwork was created by John Buscema. Has been licensed by Marvel. Includes a COA and measures 19×22 1/2. 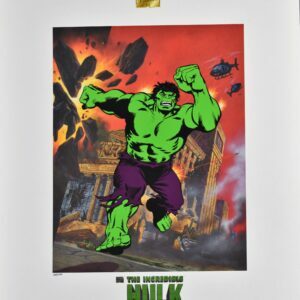 This lithoserigraph is entitled “The Incredible Hulk.” This limited edition has been limited to 500 pieces. 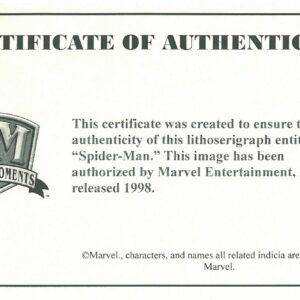 Has been licensed by Marvel. Includes a COA and measures 19×22 1/2. 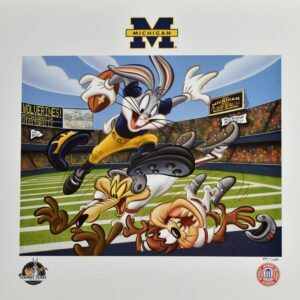 A Looney Tunes lithograph entitled “Touchdown Bugs.” This lithograph features the Looney Tunes characters representing the Michigan Wolverines on the football field. 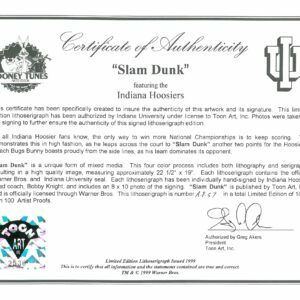 This lithograph measures 19 x 22 1/2 and comes with Certificate of Authenticity. 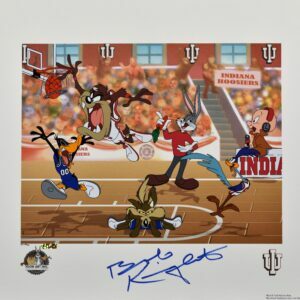 Licensed by both Warner Bros. and the Collegiate Licensing Company. 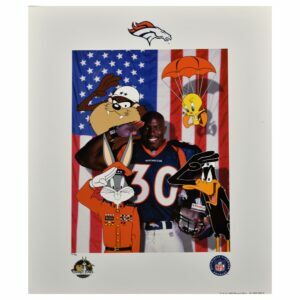 A Looney Tunes lithograph entitled “TD Salute.” This photoanimation lithograph features former Denver Broncos Player Terrell Davis. Here both Davis and the Looney Tunes are standing proudly saluting the American Flag. This lithograph measures 19 x 22 1/2 and comes with Certificate of Authenticity. 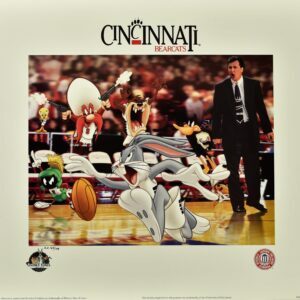 Licensed by both Warner Bros. and the National Football League. 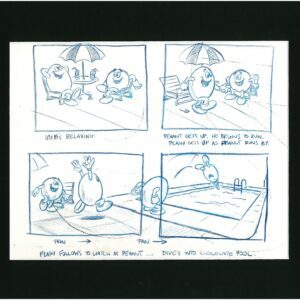 2 Story Board Drawings from Bobbies World. Bobbies World was an animated series created by Howie Mandel which aired from 1990-1998. 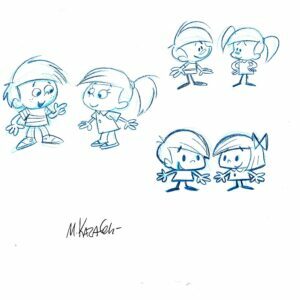 These boards were created by Mike Kazahel. One has been hand-signed. Each sheet measures 11×14. 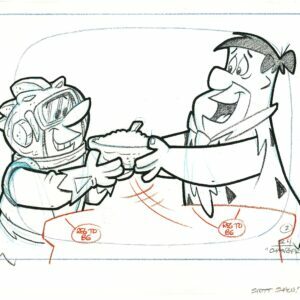 Production Cel and Matching Prod. 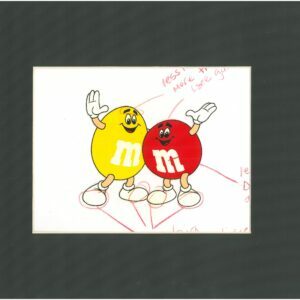 Cel/Drawing of Crazy Shapiro -Hey Good Lookin; 1982. 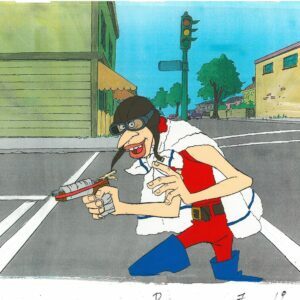 A Ralph Bakshi Production. 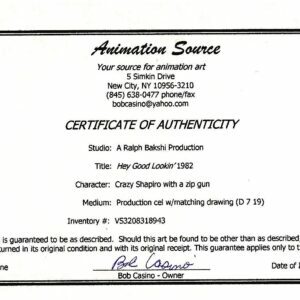 Production Cel and Matching Drawing of Crazy Shapiro with a zip gun from Hey Good Lookin; 1982. A Ralph Bakshi Production. 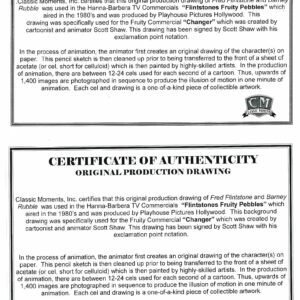 Includes COA with Inventory #. 12-Field Cel.